Special visit: Brisbane GP Dr Naomi Moss meets a young boy from the Missionaries of the Poor apostolate in Flores along with Br Lanislas, the apostolate’s resident medic, and Joan Ezbery. Photo: Supplied. 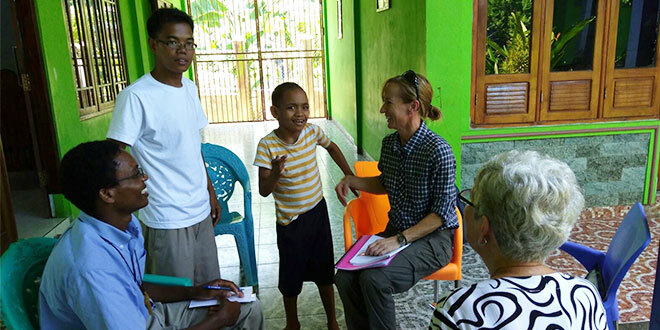 DISABLED children who were neglected and given to the permanent care of a group of religious brothers in Flores, Indonesia, have received their first visit from a doctor. The Missionaries of the Poor in Labuan Bajo, a small but poor fishing town in Flores, welcomed Dr Naomi Moss from Jindalee to their apostolate, a home for children with severe disabilities. The children’s disabilities range from Down syndrome, cerebral palsy, severe autism, and there is also one boy who cannot walk at all. Several other children have undiagnosed disabilities because they have never been assessed by a doctor. Missionaries of the Poor Brisbane associate Trevor Lambkin, who is on his fifteenth mission trip with the Brothers, said Dr Moss heard about the apostolate from her patient, Indooroopilly parishioner Georges Lefevre, and offered to provide medical assistance to the children. Mr Lambkin said this was the first time a doctor had performed an assessment on the children since the apostolate opened in 2013. “It’s the first doctor visit, and the first doctor assessing the children too,” Mr Lambkin said. “She will assist the children in the home the Brothers have in the monastery land. 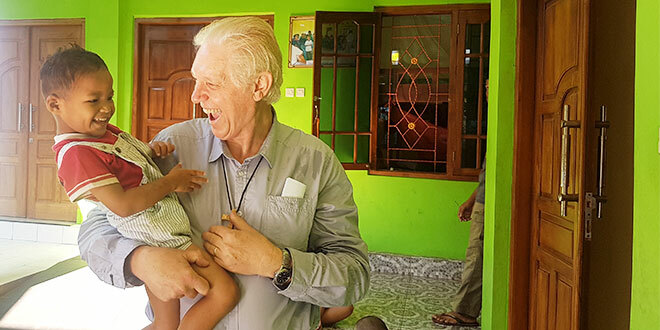 Gift of life: Trevor Lambkin has a laugh with a young boy from the Missionaries of the Poor apostolate in Flores during a previous visit. The children, who all have various disabilities, receive full-time care from the Brothers. Photo: Trevor Lambkin. Dr Moss left for Indonesia on April 6 joined by her patient Mr Lefevre, and Joan Ebzery, a physiotherapist from Indooroopilly parish who will also provide voluntary treatment for the children. Mr Lambkin and his wife, Tina Lambkin, left for Indonesia on April 8, and spent one day in Denpasar to buy shoes for the children in Flores. Following the children’s diagnosis, the volunteer medical team hope they can one day bring the children to Australia for further treatment. Mrs Lambkin said many of the children were malnourished when they came into the Brothers’ care but “by the love the Brothers give them” are becoming healthier and stronger. Six boys living at the apostolate received their First Holy Communion in September last year. The Missionaries of the Poor, one of the fastest-growing orders in the world, established their mission in Flores in June 2010 and set up the apostolate in 2013. They welcomed their first intake of orphaned children in 2014. Indooroopilly parish priest Fr Neville Yun became the first priest to visit the Flores mission when he visited the Brothers with parish missionaries in April last year. His group visited the home for disabled children run by the Brothers and was moved by their ministry, promising to establish a link with the community. Mr Lambkin said Fr Yun was “the angel” sent for the Brothers, who profess a life of radical poverty, chastity, obedience and free service to the poor, meaning all their apostolates are offered for no income. Mr Lambkin also said the Brothers in Flores were in the process of building a new chapel and required a monstrance for adoration and exposition of the Blessed Sacrament. Any parishes that can donate a monstrance to the Brothers can contact Trevor Lambkin on mopbrisbaneassociates@hotmail.com.